We use pure de-ionised water to clean solar panels. The same water that is used in window cleaning. This is completely chemical free and therefore will not damage the panels. We use telescopic poles with special ultra soft brushes designed for solar panels. This way you are left with brilliantly clean panels, generating the bestpossible return for you. How often should I have it done? Location, tree foliage, birds, main road proximity, and the season all play a factor. Many manufacturers recommend that panels are cleaned at least twice a year. Usually in the Spring and then in Autumn to get the best out of the panels in the shorter days and lower sun. If you live in an area where your windows and frames become dirty only after a few weeks then more frequent cleaning is recommended: 3 or 4 times a year. Panels laid flat or near flat will require more frequent cleaning than those on a steep pitched roof, as the dirt will settle and does not wash off. Bird strikes completely block parts of the panels and will cause more significant loss of efficiency. If you have seen an output drop or can see dirt on the corners or panels themselves, then it is time for a clean to maximise your ROI. 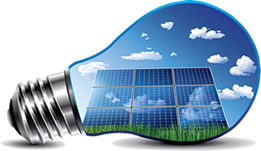 Clean solar panels are up to 30% more efficient. We are a specialist window cleaning company covering Guildford, Cranleigh and surrounding areas. The Window Cleaning Company (SE) Ltd is registered in England with company number 7545155.